The cassegrain axis does not provide a full 360 degree rotation and can only be commanded to positions in the range -86 < cass < +86. Therefore at any moment, only about half of the full range of sky position angles (PA) are available and assuming your observation is more than a few seconds long, the useful range is further restricted by the need to track the cass axis through the observation. You want to start your observation at a position where the axis will not reach its limit during the observation sequence. In some rare cases (e.g., tracking a dec +30 source for several hours as it crosses the sky passing close to the zenith) there may not be any possible configuration and the observation would need to be split into two parts, observed at different orientations. Normal procedure is to leave choice of field rotation angle to the robotic scheduler by selecting "Automatic" or "Cardinal" for the rotator in either the wizard or the sequence editor. In this mode the field rotation angle will be chosen so as to give the cardinal orientation (i.e., sky position angle 0, 90, 180 or 270) which provides the longest possible unimpeded track of the target. The sky angle may therefore change depending on the time of the night when the observation commenced, but since the orientation will always be one of the four cardinal positions, the region of sky covered is always the same. If trying to track a single target all night, there may be no viable cardinal orientation and the observation would be deemed unobservable. 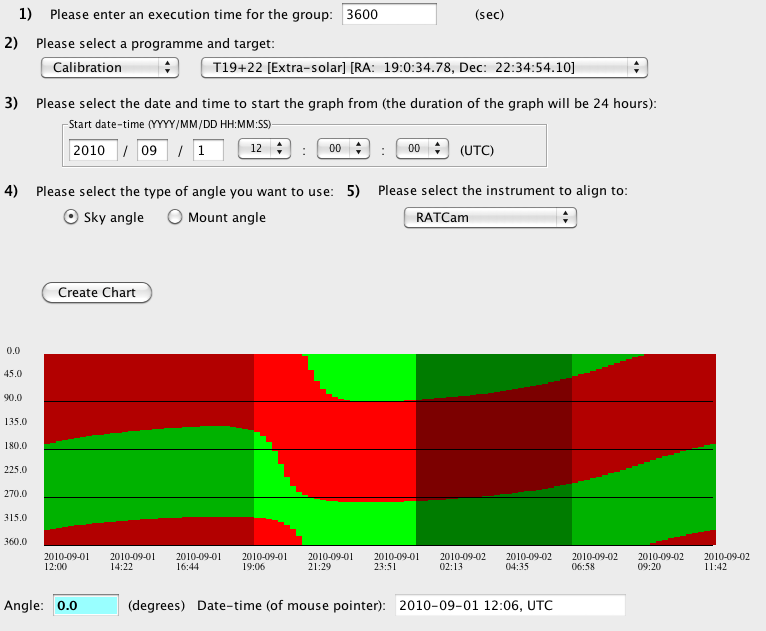 For those cases where definite selection of the sky angle is important, a software tool is available within the phase2UI which graphically represents the range of sky PAs available throughout the night for any given target. This tool should be used by any observer requesting a specific sky angle or creating a sequence more than a couple of hours long. The tool may be launched in two ways. From within the wizard, when a sequence is submitted with the rotator configuration set to MANUAL, the tool will be launched automatically. At any time select item "Tools : Rotator Angle Chart" from the top level application menus of the phase2UI. The plotting tool appears in a new window and takes the following inputs. Target position. These will be automatically populated if the tool has been started from within the wizard but will need to be set manually when just using the tool for advance planning. Plot start time. 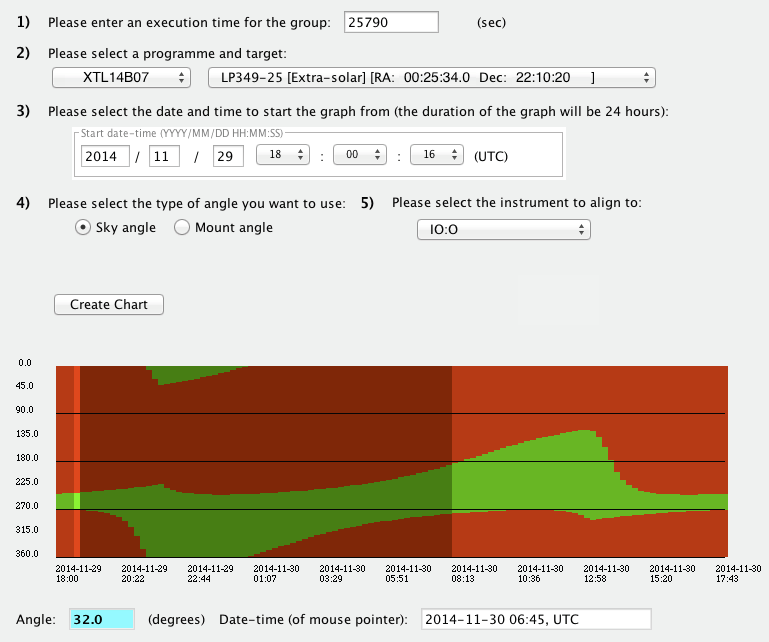 The generated plot covers 24hrs from the specified time. For fixed time groups you can specify the precise time of interest, but in most cases it is easiest to specify noon so that the plot generated covers one full night. For a long term monitoring group you may need to generate a series of plots through the semester to see how your target's circumstances change. Whether to specify sky angles or the physical mount angle of the hardware bearing. The instrument to be considered. You will normally specify you observation in terms of a SKY angle since this is the parameter of more astrophysical significance, but in some special cases (see for example Long Groups below) you might want to start the observation at a known MOUNT angle. Since the instruments are arranged in a ring around the cassegrain A&G box, the sky angle is different on each one and you need to specify on which instrument you want the sky position angles to be measured. Your sequence might use multiple instruments, but the plot will be generated referring the instrument named here. When specifying the bearing MOUNT angle, you do not need to nominate an instrument. The plot represents in green and red respectively whether an observation of the specified target and duration may or may not be started with any given sky PA at that particular time. Daylight is shown as a gently greyed region and the darkest greyed region means target will be below the horizon limit of the telescope at some point during the defined observation. For the example here we have taken a one hour RATCam observation of target "T19+22", to be performed in September. The colour code tells you whether you can start the observation at that time. You do not need the plot to remain green throughout the duration of your observation. In this example we can start our one hour observation with sky PA 220deg at 20:30UTC even though the plot turns red at 20:39UTC. Sunset is at about 19:10UTC at which time the target is already in the sky. At the start of the night, leaving the rotator on Auto/Cardinal would give an observation at sky position angle 270deg since that is the cardinal orientation with the longest available run. After about 21:15UTC, the observation can no longer be performed at 270deg and the RCS would instead choose 0deg. If you chose a sky angle of 110deg, the observation would never be possible at any point of the night. If you chose sky angle of 290deg, the observation would be possible throughout the night, at least until the target sets at 01:20UTC. 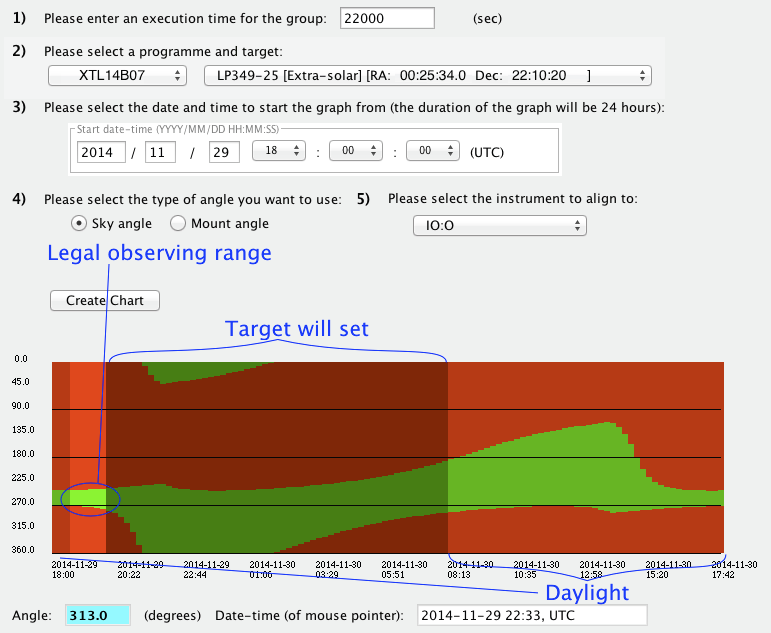 For most other angles the group would only be observable either before or after target culminated around 21:00UTC. In most cases the rotator should be left on Automatic/Cardinal and a specific angle not selected. You only need to do so in one of the following cases. After checking the plot, there is no valid cardinal orientation (0, 90, 180 or 270) for the time when the observation should be performed. There is some specific scientific need for the observation to be performed at a particular orientation. You must recognize that this is likely to render the target unobservable for portions of the night. If the rotator tool was launched automatically from within the wizard by you selecting rotator mode MANUAL then you just need to set the desired orientation angle in the box at the bottom of the tool. You can do this either by clicking on the plot or by typing directly into the box. When you commit the observation sequence to the database, the value in this box will be used. If you launched the tool from the menu then there is no explicit link to the observation group you are assessing. Once you have chosen your orientation angle you will need to open the sequence in question in the sequence editor and set the rotator configuration in the slew command. Far the most common reason to use this tool is for long observations sequences which track a single target for several hours across a large fraction of the sky. This is the only circumstance under which the restricted travel range of the cass bearing becomes significant. In this case, the availability of a suitable cardinal angle should be checked. The following is a suggested work flow. Create the target in your programme and estimate the total execution time required. Launch the rotator tool and set target, execution duration, start time and instrument of interest. Is there a valid cardinal orientation (0, 90, 180, 270)? If so then you can create your group through the wizard and simply set rotator = Automatic. This will normally be the case with the exception of targets which pass very close to the zenith. If no cardinal angle is available then you can select a favourable sky angle for your observation and set this by selecting rotator = MANUAL in the observation creation wizard. You should consider if a single track is really scientifically required since by doing so you are seriously restricting the telescope's ability to observe the target. Can you split the observation into two halves and obtain two shorter runs at different sky orientations? Then you could just leave the rotator on Automatic. The example below illustrates a case where a very long group (5.5 hours) passes close to the zenith and there is only a very small slice of time and rotator angle parameter space for which the observation is possible. If we start after 21:30UTC then the target will set before the observation is complete and starting before 20:30UTC there is actually no viable rotator position since a track of >172deg is required. For this case it might be easier to specify a MOUNT angle instead of a sky angle. The fundamental reason for the limit is that the cass mechanism is restricted to the range -86 < theta < 86, so instead of working out what sky angle will put the axis right up hard against one limit, we might as well just set the mount angle directly. We do not really care what the sky angle is. We just want to maximize as much free travel range as possible. With the rotator tool all set up for your target, select "mount" instead of "sky" and then click "Create Chart" again. Now you get a chart which shows the only legal start position for mount is near the negative range limit of the bearing. (On this plot, daylight is represented in yellow and target below the horizon as a darker yellowish grey.) The earliest that this group is possible would be at about 20:40 with the rotator mode set to MANUAL and MOUNT ANGLE = -86. Let us imagine setting up a group with a seven hour observing sequence where we want to start as soon as it is dark enough and continue until the target sets. After creating and submitting the sequence you can use the "Display Observation Sequence" button to get a pop-up which includes the "Estimated Execution Time". In our hypothetical case it shows 25790 seconds (7.16 hours). We can use the rotator tool to check the maximum available group length and also whether the de-rotator will physically be able to follow it for the whole range. From the main phase2ui window, select menu item "Tools : Rotator Angle Chart" and fill out the form. In our case execution time is 25790 and we set start time for the plot to 2014-11-29 18:00:00. That is still daylight but this way we will get a plot for the entire night. We select "Sky Angle" and "IO:O" and click "Create Chart". Interpretting the plot above: Red and Green are regions of the parameter space where the de-rotator physically cannot and can reach the target. We are fine (green) at a sky position angle near 270deg, so this group would be observed with North off the the side instead of the top of the frame. In that position the mechanism can happily follow the target all night. That's the good news. The darker shaded areas cannot be observed for other reasons. On the far left of the plot (~18:00UTC) is daylight. Similarly the sun rises about 08:00UTC the following morning. The darkest region in the middle shows times where the group cannot be started because it will set before completion. There is a tiny slice of bright green around 18:30-18:45UTC when this group can be started at sky PA ~270 and would complete before setting. However if you chek an ephemeris you will discover this is bright twilight. The target would be observable, but let is assume we want dark time. As configured here the group would never be observable. By the time twilght ends we are already in the darkly shaded "target will set" region. So next we start reducing the execution time to see what is the longest group you can fit in. For example, if we decrease the execution time to 22000sec you can see the bright green region grows to allow the group to be started at skyPA=270deg in the time between 19:30 and 20:00 which is what we want. So if we go back into the sequence editor and reduce the length of our exposures to keep the overall group execution time below 22000sec we know it will be schedulable.